Over the course of the last few centuries, the dishes on the Thanksgiving table have evolved. The early colonists and native Americans likely feasted on food such as seafood, venison, corn, chestnuts, leeks, and parsnips. Today, turkey may be the go-to main course, but let’s be honest, it’s often the vegetables that steal the show! 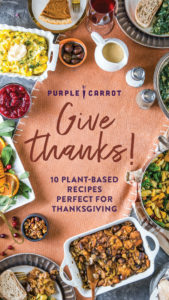 The Purple Carrot Thanksgiving Menu Planner ensures your vegan dishes will have everyone coming back for seconds. From appetizers to desserts, this comprehensive holiday menu planner will allow you to cook up a delicious and joyous plant-based holiday meal. Enjoy!